Carroll's contract, reportedly worth $11 million a year, means he will stay as head coach of the team for at least three more seasons and into his 70s. A year ago at this time there were national rumors that Pete Carroll might be considering retirement. 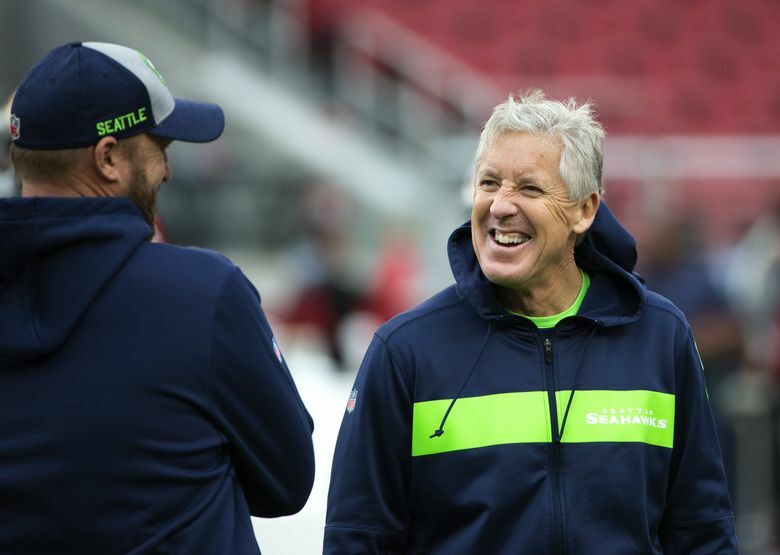 Now, after a season in which Seattle has been one of the surprise teams in the NFL, Carroll is set to coach the Seahawks into his 70s — the team and Carroll announced Monday he had signed a contract extension that will keep him in Seattle through the 2021 season. His current deal had been set to expire following the 2019 season. While the team did not release financial details, NFL.com — the league’s official website — reported the new contract will pay Carroll $11 million a year, making him “one of the highest-paid coaches” in the league. Carroll, who turned 67 on Sept. 15, has been the coach of the Seahawks since 2010 and earlier this season became the winningest coach in team history — he is 88-54-1 after a 38-31 victory over the Chiefs on Sunday night that secured the team’s seventh postseason bid in his nine seasons in Seattle. He is the only coach to the lead the team to a Super Bowl title, that coming in 2014 with a 43-8 victory over Denver. In a brief interview with reporters in the team’s media room after the contract was announced, Carroll said the team approached him about a new contract last week and he signed it Monday afternoon. “The organization has been exceedingly good to me throughout the whole time we’ve been here and they have continued to take that position and I couldn’t be happier,” said Carroll, who also holds the title of executive vice president of football operations. The contract is the fourth Carroll has signed with Seattle as he also signed extensions after the team won the Super Bowl in 2014, and again following the 2016 season. The extension gives the team some stability in the wake of the death in October of Paul Allen. Allen’s sister, Jody, has taken over control of his assets. There have been some rumblings that Jody Allen might look to eventually sell the team. But there have been no reports of any potential buyers amid indications the team is not presently for sale with Jody Allen apparently not considering it an urgent matter, in part due to the enormity of Paul Allen’s estate and having to deal with other holdings first. The Seahawks generally are considered worth roughly $2.7 billion, which by one estimate is thought to be about 10 percent of Paul Allen’s total holdings. Jody Allen, who along with Bert Kolde was one of the team’s three board of directors (along with Paul Allen), is said to have signed off on the new deal for Carroll. Carroll said he had no concerns about the team’s ownership situation and did not consider it a factor in signing a new contract. The contract also means the duo of Carroll and general manager John Schneider should continue to lead the Seahawks for at least three more seasons — Schneider signed a contract in 2016 that is thought to run through the 2022 season. Carroll essentially hired Schneider as the team’s general manager after he was lured to Seattle by Paul Allen from USC in early 2010 to succeed the fired Jim Mora. The Seahawks did not allow Schneider to interview for a similar position with his hometown Green Bay Packers following the 2017 season. Carroll said it was important for him that Schneider continue to work with him. “We have come here to do this together and he has been a great partner and we are both pumped up about everything that is coming,” Carroll said. Carroll downplayed any suggestion that this season was vital in determining his coaching future with Seattle. Undoubtedly, though, the turnaround of the past few months has everyone involved feeling as if the franchise is again on a winning track after an offseason of change and uncertainty. After Seattle did not make the playoffs in 2017 for the first time in five years, Carroll orchestrated a massive overhaul in the team’s coaching staff — firing offensive coordinator Darrell Bevell, defensive coordinator Kris Richard and offensive line coach Tom Cable — while the team also traded or released some of its biggest-name players from the 2014 Super Bowl title team, such as Michael Bennett and Richard Sherman. Many viewed the moves as Carroll exerting even more control and betting on himself that he could lead another turnaround of the team, as he had done when he took over in 2010 and, along with Schneider, brought in the Legion of Boom secondary, quarterback Russell Wilson and others who led Seattle to two consecutive Super Bowl appearances. Had the team face-planted this season — as many nationally expected — Carroll’s future would have been an overriding question heading into the offseason with just one year remaining on his contract. At 67, he already is the oldest coach in the NFL. And when Seattle got off to an 0-2 start, there were more than a few national stories speculating how long Carroll might have left. But after signing his contract Monday in the wake of nine victories in the past 13 games, Carroll said he didn’t view this season as any more critical to his coaching future than any other. Carroll has many times said he has never thought of a possible end date to his career, often citing that Marv Levy coached the Buffalo Bills until he was 72. Monday made clear that Carroll has no thoughts of giving it up any time soon.